Snyder, Lorraine. "Eric Lamaze". The Canadian Encyclopedia, 04 March 2015, Historica Canada. https://www.thecanadianencyclopedia.ca/en/article/eric-lamaze. Accessed 24 April 2019. Eric Lamaze's career took off in the early 1990s. He began competing at the Grand Prix (top-level) competition in 1992, and a year later he was named to the Canadian Equestrian Team. Eric Lamaze, equestrian (b at Montreal, Que 17 Apr 1968). Eric Lamaze overcame a tumultuous childhood to become one of Canada's top show jumpers and the first winner of an Olympic gold medal in equestrian. Lamaze grew up in Montreal, in a troubled home under the care of his grandmother. At 15 he dropped out of school, choosing instead to work in the horse industry under top trainers such as Roger Deslauriers, George Morris, Jay Hayes and Hugh Graham. His natural talent as a rider was soon recognized, and with little financial backing he was able to work his way to the top of a sport often considered elitist. Eric Lamaze's career took off in the early 1990s. He began competing at the Grand Prix (top-level) competition in 1992, and a year later he was named to the Canadian Equestrian Team. 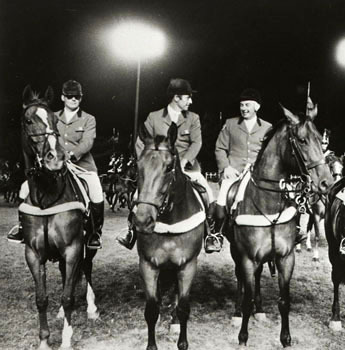 In 1994 he represented Canada at the World Equestrian Games, and finished second in the Canadian World Cup League standings. Though he continued to excel in the show ring, his success and reputation were short-lived: during the team trials leading up to the 1996 Olympics at Atlanta, Lamaze tested positive for drug use (cocaine) and was subsequently banned for 4 years. The suspension was ultimately reduced to 7 months following an appeal. Eric Lamaze earned a spot on the Canadian Olympic Team in 2000, but he was again removed from the team when he tested positive for banned substances (cold medication and diet pills, and later cocaine). This time the ban was for life, but it was ultimately overturned. Eric Lamaze spent the next 7 years rebuilding his career and damaged reputation. As a horse trader and trainer, he built his Torrey Pines Stable in Schomberg, Ont, into a successful enterprise, and as a rider Lamaze continued to perform well, representing Canada in an additional three world championships (1998, 2002, and 2006). In 2007 Eric Lamaze won Canada's richest show jumping purse, the $1 million CN International at Spruce Meadows. That year he became the first Canadian rider in 20 years to be ranked in the top-10 in the world, and he became the first North American rider to win prize money in excess of $1 million in one year. 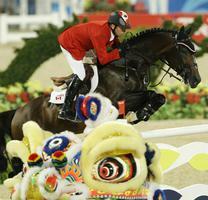 For his efforts he was named Equine Canada's 2007 Equestrian of the Year. Eric Lamaze's success in the show ring continued into 2008. During a successful summer he secured himself a spot on the Canadian Olympic Team, and leading up to the Bejing Olympics he was considered one of the top-3 riders in the world. Eric Lamaze made history when he and his mount Hickstead helped Canada's team of Ian Millar, Jill Henselwood and Mac Cone win silver, Canada's first equestrian medal since Michel Vaillancourt's silver medal in 1976. Later that week he won an individual gold medal in a jump-off against Sweden's Rolf-Goran Bengtsson, Canada's first-ever gold in the sport. Lamaze and his team were less successful in the team event at the London Summer Olympics in 2012. With only three members (teammate Tiffany Foster's horse had been ruled unfit for medical reasons), Henselwood, Millar and Lamaze finished fifth and out of medal contention. In individual showjumping competition, Lamaze finished well out of the top three in 29th position. Eloquent and often humble in the media, Eric Lamaze's riding style is described as aggressive and quick, a perfect match for the bold yet reliable jumper Hickstead. Though he has ridden many successful horses in his career, Lamaze credits Hickstead as the horse with whom he has had the greatest bond. Hickstead died unexpectedly of an aortic aneurysm in November 2011, and although badly shaken Lamaze found another horse in time to defend his Olympic title at London in 2012.